The illusions of the Trump era – spun as making America great again, while sluicing more and more wealth to the one percent – has revived citizen interest in what it would actually take to restore fairness and integrity to the nation. The first place to look is how to restructure the American corporation so that it is no longer poisoning our campaign finance system, our election outcomes, and perverting the legislative process in Washington. The majority of Congress now works for its corporate paymasters. That has resulted in perverse economic outcomes across the national landscape that have, in turn, created the greatest wealth inequality in America since the late 1920s. While reforming the way political campaigns are financed in America has received a great deal of attention, far too little attention has been given to the grotesque disfiguration of far too many corporate Boards in America. Take JPMorgan Chase for example. According to its 2017 proxy statement, one of its Board members, Laban P. Jackson, Jr., received a total of $532,500 in compensation in 2016 for serving as a Director of the bank. Of that amount, $115,000 was paid in cash for service on the Board of JPMorgan Chase; $225,000 was in an annual stock award that must be retained until he retires from the Board; $110,000 was paid for serving as a Director of J.P. Morgan Securities plc, a subsidiary of JPMorgan Chase in the United Kingdom; along with other fees including a payment of $2500 (paid to all Board members) when they attend a “Specific Purpose Committee” meeting. According to the 2017 proxy statement, JPMorgan’s lavishly paid Board, which currently receives $75,000 annually in cash and $225,000 in stock will get a 25 percent increase in cash compensation, moving to $100,000 while the stock award moves from an annual $225,000 to $250,000. This lavish pay package for the Board of a Wall Street bank compares to a projected miserly increase of 3.2 percent for the average American worker in 2018. JPMorgan’s sprawling and complex footprint in 60 countries around the globe came into focus at a Senate Banking hearing on July 15, 2014. The witness that day was Fed Chair Janet Yellen. Senator Elizabeth Warren reminded Yellen that at the time of its collapse in 2008, Lehman Brothers had $639 billion in assets and 209 subsidiaries and it took three years to unwind the bank in bankruptcy. Warren singled out JPMorgan Chase for comparison, saying that it has $2.5 trillion in assets and 3,391 subsidiaries. According to the latest data from the regulator of national banks, the Office of the Comptroller of the Currency (OCC), JPMorgan Chase also had $52 trillion in notional derivatives at its bank holding company as of September 30, 2017. Let that sink in for a moment. The bank was gambling not with its own money but with its depositors’ money and it lost $6.2 billion. Jamie Dimon was Chairman and CEO of JPMorgan Chase at the time this occurred and he kept both of those jobs courtesy of his highly compensated Board of Directors. New York Stock Exchange rules require that listed companies have a majority of independent directors on the Board. Thus it would seem to follow that the person chairing this independent Board should also be independent. And yet, across corporate America, we find today that the top executive of the company is typically also the Chair of the so-called “independent” Board. Jamie Dimon became the CEO of JPMorgan Chase on January 1, 2006. The bank was more than a century old and had never been charged with a criminal felony up to that point. In 2014, the Justice Department charged JPMorgan Chase with two felony counts in connection with their role in facilitating the Madoff Ponzi scheme. The bank was given a two-year deferred prosecution agreement. The very next year, in May 2015, JPMorgan Chase was hit with a new felony count for its role in rigging foreign currency markets as part of a banking cartel. 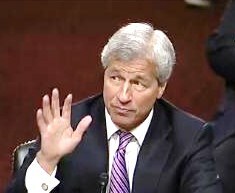 That’s three felony counts in two years and yet the highly compensated Board of JPMorgan Chase allowed Dimon to keep his job as Chairman of the Board and CEO of the company. Prior to the felony counts there was a $13 billion settlement with the Justice Department and Federal and State regulators in 2013 for JPMorgan Chase’s role in selling toxic mortgage investments to investors as worthwhile products when the bank had good reason to believe they would blow up. There seems to be no shame today in the Oval Office or in the corporate Board room. Only citizens, not billionaires, can turn this country around.